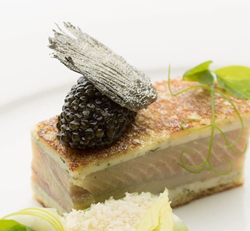 Sterling Caviar, LLC is proud to announce world-renowned Bocuse d'Or award winner, American Chef, Philip Tessier as its 2019 brand ambassador. Sterling Caviar, LLC is proud to announce world-renowned American Chef, Philip Tessier as its 2019 brand ambassador. Philip Tessier, is an award-winning chef, author of Chasing Bocuse, and innovator living and working in the famous Napa Valley Wine Country. He was the first American chef to place in the prestigious Bocuse d’Or tournament earning a silver medal for team United States. Later he went on to coach the 2017 American team, led by Matthew Peters. That year, the team took Gold. Sterling will work with Philip to educate consumers and chefs worldwide about their California Farmed White Sturgeon Caviar. From recipes, to harvest education, and the importance of sustainable farming, they will lead the greater conversation on the influence and prestige of American caviar. International caviar imports to the United States have grown tremendously over the past decade, and it is critical that chefs access information on the importance of supporting the leading American farm, Sterling and its transparent practices, during this period of increased demand. Sterling is honored to welcome Phil to support this messaging as he states, "Sterling has set the standard for the craft, science, and quality behind today’s caviar! Excited to share more as we move forward together." In 1988, Stolt Sea Farm opened Stolt Sea Farm California LLC – an aquatic home in Northern California to farm-raised white sturgeon. The farm was the first to raise the world-famous sturgeon, the fish from which the delicacy caviar comes. In 2006, Stolt Sea Farm California, LLC changed their name to Sterling Caviar, LLC. Today, Sterling Caviar is the leader in sustainable sturgeon farming and sturgeon caviar production. Its innovative land-based farms consistently recognized for their sustainable farming practices and the long-term protection of the sturgeon species. Looking to the future, as consumer demand for sustainably-farmed and locally-produced food products increases, Sterling anticipates continued growth in production and sales as well as an expansion in their retail division.